Can’t Make it to Ecumenical Advocacy Days? A FULL, MULTI-YEAR REAUTHORIZATION OF THE FARM BILL. Our nation’s food and farm policies, as embodied in the farm bill, affect people from rural America to inner cities, from our local communities to less industrialized regions around the world. The farm bill is the single largest piece of federal policy impacting our food system. A good farm bill can strengthen nutrition programs, help our struggling rural communities, support new and socially disadvantaged farmers, enhance global food aid to the world’s most impoverished, and encourage farming and ranching practices that protect God’s creation. Congress failed to pass a farm bill in 2012, and a number of important programs that promote a just and healthy food system are currently without funding. Other programs are continuing, but need the certainty provided by a multi-year farm bill. 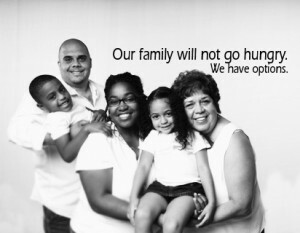 Protects and strengthens programs that reduce hunger and improve nutrition in the United States. We ask that funding for the Supplemental Nutrition Assistance Program, or SNAP (formerly known as food stamps) be protected from cuts and harmful structural changes that would increase hunger in our nation. Sustains robust international food aid and improves the nutritional quality of food aid. In view of the ongoing threat of high food prices, natural disasters and humanitarian crises around the world, we ask for robust funding for programs that provide emergency and non-emergency food aid for the hungry. As the world’s largest provider of international food aid, the United States must also lead the way in improving its quality to maximize the nutritional benefit. Helps beginning farmers and farmers from socially disadvantaged groups start in the business of agriculture. We ask Congress to support new farmers by funding programs that are critical in growing the next generation of farmers, an imperative goal in light of the aging of American farmers and in bolstering women and minority farmers. Builds local and regional food systems and the rural communities at their center. For communities in the United States, we ask Congress to support programs such as the Farmers Market Promotion Program, which provides new markets for small and mid-sized farmers in suburbs and cities, offering consumers the opportunity to support local producers and giving people in vulnerable communities greater access to fresh food. For communities around the world, we ask Congress to reform international food aid by purchasing more of the food in the areas where it is consumed. The Local and Regional Procurement Program can help more hungry people for the same cost, support rural development in low-income countries and increase global food security. Strengthens policies and programs that promote conservation of soil and water and protect creation from environmental degradation. We ask Congress to protect funding for conservation programs, particularly those for working lands such as the Conservation Stewardship Program, which have substantial waiting lists and serve a diverse base of farmers and ranchers. Funds for these programs should not be used to pay for other priorities. Farms and ranches account for a majority of the land base in many states, and play a key role in ensuring soil and water quality and in maintaining open space and wildlife habitat.